When the CPSU took 12 government agencies to Fair Work Australia (FWA) a couple of weeks ago in a dispute over negotiating enterprise agreement, it barely rated a mention in the press. And, if the comments in the Sydney Morning Herald’s online edition are anything to go by (‘The Australian Public Service might go on strike? Would anybody notice?’ and ‘How about the government reduce the rate of pay for public service jobs so we can all enjoy paying a little less tax? Better still; how about they halve the public service? That’d be a good start…’), the public unsurprisingly have little sympathy for a public service pay claim. But if you’ll allow me to indulge in some IR nerdiness, this is actually quite an interesting dispute. The dispute brought before the tribunal is not just about those poor public servants not being paid enough. It’s actually got a lot to do with their right to bargain for entitlements in the first place. A bit of background. An enterprise agreement is an agreement between an employer and its employees on wages and entitlements pertaining to the employment relationship. It contains things like pay rates, tea breaks, penalty and overtime payments, rostering provisions – pretty much the things that are contained in awards, but to a standard that has been negotiated and has been considered better than the award. Now let’s go back a step. Who is an employer? An employer is basically (and under common law) someone who pays your wages. So an enterprise agreement is between the employees (to whom the agreement will apply) and the person who pays your wages; and the people, or their representatives (such as the union and the guy from HR) sit down at a table and try and strike a deal. The employees presumably want a bigger pay packet and a better workplace. They decide on a set of wages and conditions that think everyone will be happy with, it goes to a vote, then it goes off to Fair Work Australia to be approved. 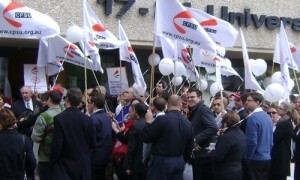 The dispute in question is about a third party, the Australian Public Service Commission (APSC), and their involvement in the bargaining process. [T]he role [that] the APSC plays imposes an obligation on all of the agencies that are here in terms of seeking inclusion of their model clauses and what has become known as the recommended terms and conditions in this bargaining process. At no stage has the APSC sought to engage with the CPSU about our claim, not even to the point of seeking a briefing from CPSU on our claim and there are certainly misunderstandings at the APSC about our claim. The APSC is not the boss of other agencies. It’s there to recommend, not to dictate. It does however seem to have some sort of power to approve or not approve enterprise agreements that have been agreed to by the bargaining representatives. This means that, regardless of how the people who will be covered by the agreement feel, they may never get to a vote on it. We also understand in terms of the process by which the APSC has been providing advice to agencies at their advisory sessions that they’re very clear in their language at those advisory sessions about what will and will not be approved by the APSC. We understand in relation to leave, one of the issues that we have raised to seek to have discussions with the APSC and that is an issue of some moment in many of the bargaining rounds with many of the agencies that are here today, that the APSC in terms of a myths and reality power-point presentation indicated that only one agency in the APS has been approved by the APSC to offer more than 18 days personal leave and that, whatever you may hear, no other agencies have been approved to be offering any more than 18 days. Where in the legislation, the section that sets out the laws relating to making enterprise agreements, does it say a third party can tell the employer and the employee what it can and can’t put in their agreements? What if I were the head of Centrelink and was happy to agree to 20 days personal leave for my employees? It’s in my budget, and I think it will increase productivity: why shouldn’t I be able to? A good question might be: why is CPSU wasting the time of these twelve other agencies (the tax office, the Department of Defence, the Fair Work Ombudsman and the like) if the issue is really about the role of APSC? Why doesn’t the CPSU just take the APSC to Fair Work Australia? Because the Act says they can bring a bargaining dispute for a proposed agreement before the tribunal. And because the CPSU is negotiating a raft of public service agreements that are all impacted on by this framework, this is the way they’ve chosen to try and address the framework itself. Although this approach is really their best chance at tackling this issue at this stage, I’m not sure if it will work. A lot of the time, bargaining disputes are brought before the tribunal to make a point, to throw some power around, waste time or get some publicity. But the dispute is important because the public service is often the leader when it comes to pay and conditions. And this makes the outcome relevant for all of us. I’m not too bothered if the public servants get their pay rise or not; that will come down to their ability to bargain well. I am however bothered by the prospect of anyone, employer or employees, not being able to bargain because of the spurious ‘guidance’ of a third party.